The two types of shower fixtures we’re going to review here are dual shower heads and dual shower systems. They are a combination of fixed and handheld shower heads. Dual shower heads are just the combination of a handheld and standard shower head that can easily be swapped out with your existing shower head since it does not require new plumbing. These may have two spray heads or be 2-in-1 shower heads that are also detachable handhelds. Dual shower systems are a combination of the shower head, handheld, and valves. Some of them even have a tub spout below the valves. In short, they are a single piece that integrates all the components of your shower fixtures into one. We’re not including shower panels in this category since they go far beyond the features of a “dual” shower head. If you want to go the extra mile for your shower experience you might be interested in shower panels. You can read our shower panel reviews and see if they might be something your interested in. They do require more work than just screwing on a new shower head, but the end result is a completely different shower experience. The combination of a fixed and handheld shower head gives you more flexibility than a basic shower head. Cleaning yourself, animals, and the shower itself is much easier with the detachable handheld. One of the clear differences between shower systems and dual shower heads is that they add additional piping to your existing plumbing, but outside the wall. This is advantageous for taller people that struggle to find a shower head that doesn’t get in the way or can be adjusted to fit their height. If you’re tall and don’t want to redo your plumbing to move the shower pipe higher, then consider a shower system. This is a general category of shower fixtures that are a combination of shower head, handheld, and some models may also have the control valve and tub spout. Often these shower systems include an adjustable height bar for the handheld (helpful for seated showering). Optionally, you can extend the height of your shower head using an extension pipe, which is necessary if you’re too tall for most common shower head placements and don’t want to tear into existing plumbing. Why choose a Shower System? There are a few differences with shower systems that might make you consider them over simply upgrading your shower head. There are such a variety of shower systems available that will have different plumbing requirements, so we’ll cover that in the review section for our recommended shower system models. These features listed below are focused on the shower experience rather than plumbing. Seated showering is more convenient with adjustable sliding bars for the handheld. For many shower systems, water is sprayed from overhead rather than at an angle. Most top quality shower systems are almost completely made from metal. No coated plastic. Accommodates tall people. Our top pick model is capable of being extended at least 6 inches higher than the water outlet without tearing into existing plumbing. The fact that the water is sprayed from overhead is the main reason it’s possible to simply add an extension pipe if you need the shower head to be higher up. This isn’t true for all shower systems, but our top pick, the Grohe Euphoria, is an excellent choice is height is an issue for you. Part of the appeal of rainfall shower heads are the complete coverage of warm water. This is best accomplished when the water is spray from overhead, and that makes shower systems a great choice if the rainfall effect appeals to you. Lastly, because shower systems include their own external piping for the shower head and handheld they are mostly made from metal. Many people complain about shower heads being a mostly plastic and cheap feeling. While plastic isn’t necessarily a bad thing, you will be happy with the solid metal feel of a shower system. All three of these shower head models have 3-way diverters and let you use the handheld, shower head, or both at the same time. When cleaning the shower itself or washing animals you often want to either easily direct the water away or be able to turn it off completely to scrub or apply soap. This can be accomplished without turning the water off completely and having to reset the temperature. You can switch the water to handheld only and use the handheld controls to turn the water off or just point it away from the area you’re trying to clean. Being able to seamless switch between the handheld and shower head means you can easily dock and un-dock the handheld. It’s annoying to set the handheld back into place only to have it fall. You shouldn’t have that problem with any of these models. The two Delta models have the best docking mechanism of our selection. The combination of excellent build quality, flow controls, water pattern coverage, and price make this our top choice. The MagnaTite docking makes it easy to snap the handheld back into place. The H20kinetic spray effectively maximizes coverage and warmth, and with the ability to use both handheld and shower head at the same time you are left satisfied. At first glance, the lack of dozens of tiny spray nozzles makes you wonder if this shower head can deliver. It actually works extremely well, and produces larger droplets of water that overlap from each nozzle to give a more homogenous spray pattern. Smaller water droplets seem to lose their intensity by the time they hit you and cover a smaller area, which might leave you feeling cold. The larger droplets of water are definitely a satisfying part of this shower head. There are 4 spray options: Massaging Spray, H2OKinetic Spray, H20Kinetic Spray with massage, and Pause. The massaging spray is a focus, center stream with high intensity. The H20Kinetic spray will be your daily wash setting and sprays a wide cone of large droplets that give you complete coverage. The combination of both is a wider stream than just the massage setting but still more dense than the H20Kinetic spray alone. The 60″ stretchable metal hose won’t tangle or twist up. All of the main fittings are made of metal. There are a few different finish options available: Champagne Bronze, Chrome, Polished Nickel, Stainless, Venetian Bronze. Don’t let the odd shape of the handheld turn you off. Its shape seems to make docking the handheld easier as it naturally locks into place. The build quality is excellent and the spray options leave you satisfied. The spray settings and docking mechanism for this Delta shower head are the same as our Top Pick, but the resulting spray is different. The Delta H20kinetic model results in larger droplets of water and a harder feeling spray, some people find that more satisfying. You do still get the complete warmth and coverage from the runner-up model. The main plumbing connection is metal while the majority of the external body of the shower head is plastic with a chrome colored coating. This dual shower head has metal fittings, 3-way diverter, 5 spray functions, and a steel hose. The anti-clog nozzles are easy to clean and maintain pressure. This very affordable Ana Bath shower head is a great budget pick. This dual shower head by Ana Bath has 5 spray settings: Saturating Spray, Massage Spray, Massage Saturating Mix, Bubbling Spray, and Bubbling Saturating Mix. Like our Runner-up Delta model, the rub-clean jets are easy to keep free of mineral build up. The 5 ft. flexible stainless steel hose won’t get warped and tangled, and is easy to replace with a longer hose if you need it. You will be able to use either the shower head, handheld, or both thanks to the 3-way diverter. This is true for all three of our recommended models. The handheld is placed separately from the shower head and isn’t quite as easy to dock, but still is not significant problem. Despite being mostly plastic, the fittings are metal and are great quality for the price. If you choose this bargain shower head, we don’t think you’ll be disappointed. Our top shower system can be used with your existing valve and tub spout, and has the option to fit a 6-inch extension for the shower head. The adjustable slide bar for the handheld makes this shower system a great choice for seated showering as well. The quality, performance and customizability are the main reasons this is our top choice. The height of the shower head for this system will sit at about the same height as the pipe coming out of your wall. So if you’re trying to estimate the height after the 6″ extension you just need to measure the height of your water outlet and add six inches. The center of the shower head will sit approximately 17.69″ out from the wall. You can read more about the specifications here. You also have the option of getting a custom pipe made if you need more or less than the six inch extension. Matching the finish might be difficult but at least you have the option of customization. All of the pipe connections are 1/2″ NPT. If you’re looking for something a little more affordable and still good quality, then the Kauai III (1011) is a great choice. Keep in mind the loop above the shower head and make sure you have enough ceiling room. The Kauai (1011) by Pulse is a great second choice with a built-in soap dish. The soap dish is made of plastic, which we consider to be a positive since you often see rust on older shower racks since they’re not made of the same material as the shower system piping. You can read more about the specifications here. You won’t be able to install an extension with this model, but the height of the shower head will sit about 1.75″ higher than your water outlet. The shower head is slightly farther out from the wall than the Grohe model at 19″. You can use your existing shower valve. The 1019 is an even more affordable model by Pulse. The shower head center sits about 21 inches out from the wall, which is the longest reach of these 3 models. The top loop extends further than the 1011 at about 8 inches above the shower head base. Be sure you have room! This shower system is very similar to the Pulse Model 1011. The center of the shower head will be about 21 inches from the wall. That’s the farthest reach of any of the models we’ve shown. You will be able to use your existing control valve. The loop above the shower head extends about 8 inches from the base of the shower head, which is taller than the Model 1011 (which extends 5.75″). Be sure you have enough clearance. You’ll want to make sure there’s at least 8 inches of space above your water outlet. This Zovajonia shower system has plenty of finish options to choose from, so you’ll be able to match it with your other fixtures and color scheme. You might find the addition of the bath tap is unnecessary, but depending on what type of bath or tub you might be installing this with it can be a nice feature. This Sun Rise shower system is unlike the other shower systems we’ve looked at since all 3 pieces are installed separately. There are a lot more systems like this out there, but keep in mind that if you ever decide to change shower systems you will likely have to cover up where the handheld portion of this one was located. You will only want to consider this model if you’re looking to do an in-depth remodel of your shower or are doing a new installation. The 10″ rainfall shower head is the perfect size and is the biggest one on this list. You get plenty of water coverage. However, you won’t be able to use the handheld and shower head at the same time. Why switch to a dual shower head? 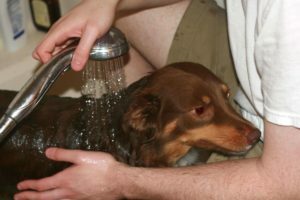 If you have animals, a handheld shower head is one of the best ways to bathe them. Forget using a cup. You can get a soft and consistent stream of water instead of dumping a cup of water on them repeatedly. For humans, you can reach just about any nook and cranny with a handheld shower head. Just had surgery and want to avoid messing up bandages? You have more control with a handheld in these kinds of situations. More common than that: sunburns. You can easily avoid burned skin and make sure you get clean. What about shaving your legs, ladies? You either have to try to position your leg under the tub faucet, take an entire shower afterwards, or use a cup to pour water. That’s easily solved with a handheld. So why not just buy a handheld only shower head? There are some great handheld shower heads out there. My favorite is the Moen Magnetix Shower Heads with a magnetic dock for the handheld. Being able to simply touch the shower head to the dock makes a huge difference in convenience. No messing with a bracket and trying to get the handheld back into position. With a dual shower head, you don’t have to worry about keeping the handheld in a certain position if you just want a simple shower. Often you’ll find that handheld-only shower heads shift around in the mounting bracket, or the hose pushes against the wall which can mess up the positioning of the stream. You can have the best of both worlds at an affordable price. Of course there are many other features to consider. Sliding bars are great if you need to sit in the shower as they let you lower the handheld dock. Larger diameter shower heads are going to give you more coverage. Generally, the higher price shower heads have more metal components, but you will be hard-pressed to find a 100% metal shower head or system. So which components should be metal? You will want metal fittings where the shower head attaches to the shower pipe, as that’s the most important connection. Aside from that, the hose connected to the handheld shower head is something you will want to be metal. Rubber or plastic hoses will eventually twist up and contort due to the temperature fluctuations caused by the water running through them. This is extremely annoying when you have to unwind the hose every time you use the handheld. It’s difficult to find out exactly what each part of a shower head or system is made of. Even “stainless” steel can eventually rust in certain conditions. If you see any reports of rust then avoid that product. Here are some general tips to keep in mind before and after installation. Be sure to use several full wraps of thread tape on each fitting. If you’re not happy with the water pressure of your shower head, try removing the flow restrictors. Often there’s more than one. Some metals hoses end up rusting over years of use. You don’t have to replace the entire shower head or system. Just buy a new hose! Removing a flow restrictor can be the difference between a 5-star shower head and and 2-star shower head. Be sure you’re not violating any state regulations! Not all shower heads or systems come with a pause function. If you want to stop the water flow you have to completely turn your water off and then find the right temperature again. That’s not necessary with a Shut-off valve.